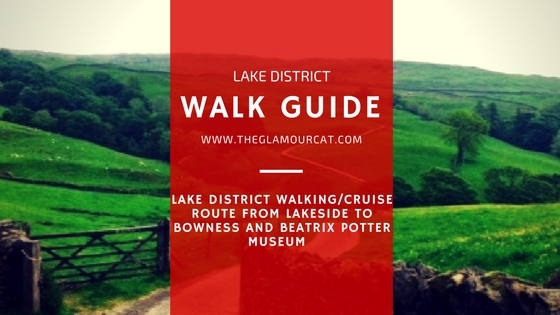 I discovered this walk from Jonathan Rob who works at Lakeside Hotel on Lake Windemere, who suggested we do this when he heard that me and my partner were keen walkers and wanted to fit into as much into one day as we could. This walk is medium level and takes a good six hours. Take these essentials and remember to soak up the beautiful mountains, lakes and greenery with your eyes as much as you can, as you can get distracted by the steep hill climbs very easily. This walk takes you by foot and cruise around the beautiful Lake Windemere and the breathtaking view point from Orrest Head is stunning. Hiking Boots- Sounds obvious, but you would be surprised how many people think that wearing boots, trainers or wellies will be absolutely fine for a long walk in this type of terrain. need something with grip. I like to use the brand Regatta for hiking boots as they have a lot of bounce and flexibility in them and I have a high instep. Sunblock- As you get so high up in the mountains you will need to put on a one-day sun protection before you go. I like the Piz Buin all day protection myself as once you are on this walk you will certainly be glowing and reapplication could get messy. Cover your face, ears, the back of your neck and your arms and feet. Lip Protection- It's the one thing people forget when protecting their face walking- your lips will get dry and flake if you don't use a good lip balm. I use Nivea Sun Protect Lip Balm which has SPF30 in it and is super moisturising. Sunglasses-Take sunglasses that have 400 UV protection as you will see the scenery much better through the lenses the light is so bright when you get to the top of the mountains. Phone- It’s pretty likely at some point you will need to know where you are, as these walks can be complicated so at least if you have Google maps you can see where you are. Also if you have an emergency then at least you know you can call for help and tell them your location. I like to use a great phone app called irunner which tracks your time, map of your walk, elevation ascent and descent, CPM average, calories burned, distance, and average pace so afterwards you can bask in the glory that you have burned enough for a lovely dinner. On this walk I burnt 1900 calories- yes really! Pedometer- If you want to track your calories and steps/distance but don't want to use your phone then invest in a mini pedometer. Camera- If you don't want to use your phone camera then of course pack this as an essential. I have some great pictures that I have taken on walks that have been captured in a moment and could never be recreated again, that I will be making into canvas pictures. Water- 2 litres of water. You should aim for a litre bottle for every 2 hours per person so we packed two each. Wet-wipes- These serve as an all purpose must have on your walk. Great for cleaning up sticky hands, wipe up mud/dirt and of course, you cannot always guarantee a toilet stop on your walks so these will help! Thin Layer Clothing- The mornings and evenings are chilly around the lake but the walking and climbing in the day is so hot, so wear walking trousers (Which look like leggings), sports underwear, a loose T Shirt and a running jacket that you can easily tie around your waist. Pen and Paper- On your walk you might see places, plants or things you want to remember and when you get back from your walk, I can guarantee you though that unless you have it written down, it will elude your walking memory so pack this to be sure. Power Food- If you are not planning on taking a picnic then bring some power nibbles to give you a super boost when you are getting tired on your walk. Favourites of mine include Raisons, Nuts, Dark Chocolate, Dried Apples, Bananas and if you are going to go for something naughty then pack a Snickers Bar because it will give you a great instant boost. With spectacular lake and mountain views and a lakeshore path. The cruises are literally outside Lakeside hotel. There is a railway and a cruise company with a little cafe here. 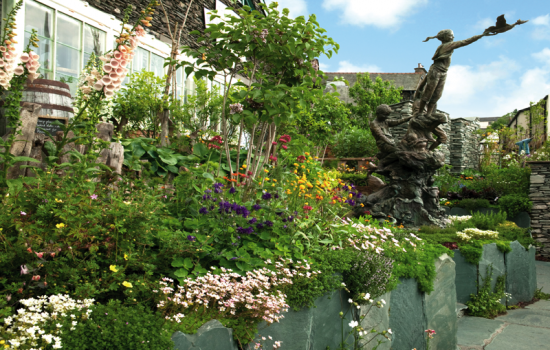 take the Windermere Lake cruise all the way to Waterhead. 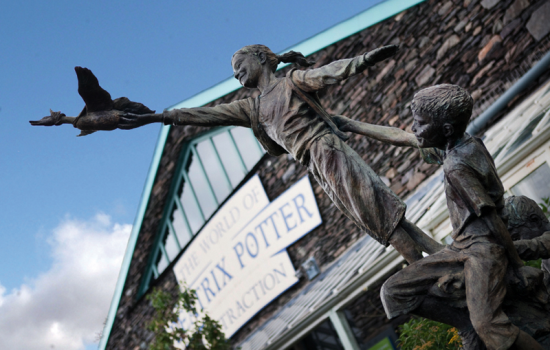 Take the boat from Lake Windemere to Waterhead hotel. This is where you catch the boat from, just walk to the harbour from here. We used Windemere Lake Cruises who were great as they were really friendly and on time. If you get a Freedom Ticket (Freedom of the Lake and Lakes Aquarium) then you get to go up and down the lake all day as much as you want so it's good value. It is £24.45 for this ticket type for an adult but you can buy cheaper options if you want to. Visit their website www.windermere-lakecruises.co.uk to book tickets. We went really early in the morning and the fog from the lake created a magical and mystical journey. Here is the view of Lakeside Hotel and the pier where you catch the boat. Relaxing on the boat- it gets nippy so bring light layers you can wrap up in. The boats have inside seating and a bar with hot and cold drinks if you prefer to sit inside. There is also a toilet. The view of the lake from the boat. When you get off the boat at the pier, walk past the Waterhead Hotel on your left and cross the road. It’s quite a busy road so be really careful if you have small children. When you cross the road walk left a bit more and you will see a sign saying Jenkins Crag. Here you will start climbing a really steep rocky and stony hill, which is super narrow and quite slippery to climb. They say start as you mean to go on and this bit will have your heart pumping straight away. After about 15 mins the path will level out and then you cross a field into the woodland. Keep walking to the right for about twenty minutes, until you see a National Trust sign that says Kelsick Scar. This bit of the wood gets confusing as you might see people look like they are walking upwards on another path and the there are lots of broken trees and paths. Just keep walking to the right and slightly upwards following the rough track in the wood. Some of the track is so steep that I had to hold onto branches just to launch myself up. You will see the beautiful woods beneath you, as you get slightly higher. Be prepared to get dirty, as you will need to slide and jump over several bits of wildlife- good fun though! The path will be upwards and right all the way. Ahead you will then see a sign that says Jenkins Crag where there is a point where the path divides into two. Follow the sign to Jenkins Crag and run up the big stones to see a breathtaking view of the wonderful Lake District and Lake Windermere. Keep walking to the right through the woodland until you get to High Skelghyll Farm. Grid. The path swings to the left and you will need to follow this up to reach Robin’s Lane. It will take you a good twenty minutes to walk up here to reach Robin’s Lane. When you get there walk along for 2 minutes and then you will see another lane on your right hand side, which has Brockhole leading up from it. Keep walking along and upwards. You will see so many sheep up close in the hills and magnificent views. Keep walking for about 20 minutes going through gates and seeing stonewalls on your right hand side. Soon you will come to a wooden bench that overlooks the sights. Have a seat here and get your breath back. Directly in front of you and the bench, there is a steep bridleway track. Follow this track down watching your footing as you go for about ten minutes until you get to a road. Turn left here and then walk along the road for about ten minutes until you see a Bridleway on your right hand side. Follow this pathway down towards a white cottage called Town Foot. You will then see a road that you cross and follow down towards a river. Somewhere along here I found a sign saying St Catherine's (my name) and Low Hag Wood, so you know you are on the right track if you follow this. Once you at the river you will cross two wooden footbridges. Take your time here as the gentle stream of the river is very soothing and it is very pretty here. If you are here in the autumn then you will see large Salmon and Sea Trout in the river coming from the sea to their spawning grounds on Troutbeck Valley. Walk forward until you come to a gate- go through this walk up to the top of a field. 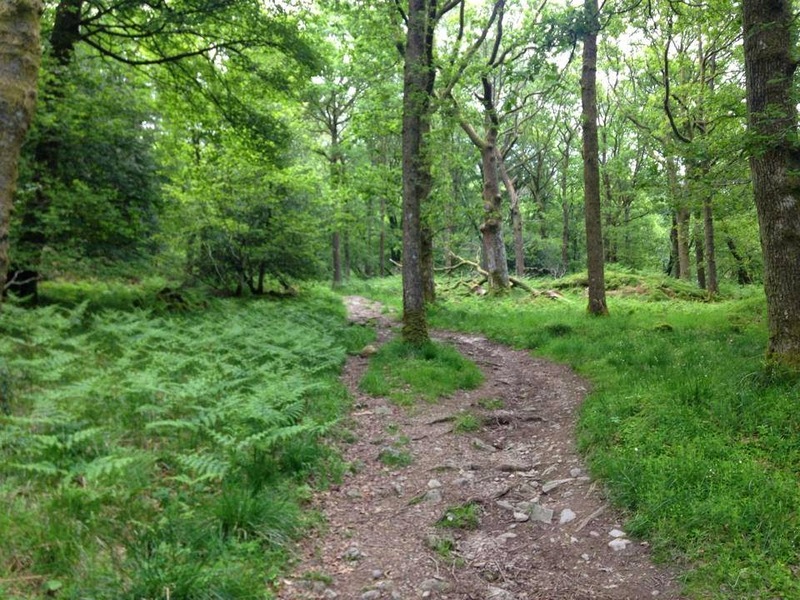 Here follow a path which is the A592 from Windermere to Ullswater At the end turn right and follow the footpath along by the roadside for 400 metres, then cross the road to a kissing gate and public footpath which leads upwards through two fields. Walk across the field going upwards and right, you will pass a tree that looks like it is on it’s own and then keep walking this way and you will see great views of trees behind you. At the top, look out for Annie’s Seat and enjoy this lake view here from Coniston and Wetherlam. Then keep walking right till you get to a wooden stile and continue between two buildings to the road. Cross into a lane and go over a cattle grid and after 100 metres go left. You are now on a surfaced farm road, which you will follow for 400 metres. When you reach the farm, walk past the first building and then look for a wooden stile on your right. Cross this and go through the farmyard looking for yellow arrows to guide you through. Cross two fields following yellow arrows. You will pass some stiles and you will soon reach white farm cottages. Proceed down this lane and turn left till you get to Crosses Farm. Follow this road and in 400 mins you will come to Causeway Farm. At Causeway farm keep walking across the field until you come to a path markerked public footpath and you cross over to the other side of a wall by a stone stile. Keep close to the wall on the right and walk forwards passing a small stream and walking upwards towards a high point. Before you get to the summit you will see signs pointing you towards Orrest Head and a see stonewall guiding you up to the summit. This is after you have crossed some fields. It is super steep here so take your time walking up and keep looking behind you at the stunning views. I had to have a lay down at this point and hold into the markers on the way just to hold myself up! 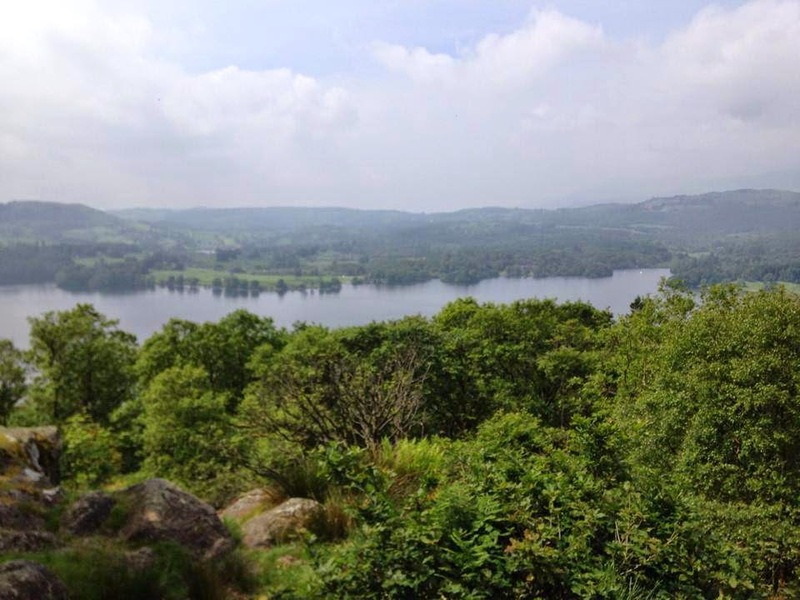 Finally, when you reach the top of Orrest Head you will see breathtaking views of the lake and beyond to the Lakeland Fells. This view inspired Wainwright on his first visit to the Lake District. The view is a great 360 full circle of stunning scenery and the entire walk seems worthwhile once you are at the top. There are benches so you could have a nice picnic up here or rest on the large boulder rocks. There are quite a few tourists here who will have walked here from different routes. We saw some Japanese tourists all doing Yoga. Just take in what you want yourself and start to make your way down to the right when you feel like it is time to go. We personally preferred a patch of clear field just before the Summit where there were great views and pretty mountain flowers. Start walking down towards the right of the mountain. There is a stone path you can go down which is really steep and pebbly so be really careful. 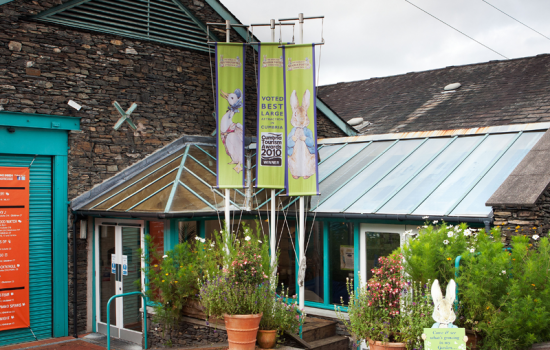 Head towards Windermere Village (you will see signs). Here you will start walking into the nice calm shaded wooded pathway until you get to the main road that you want to head towards Ambleside. You will see St Mary’s Church and just past the church take the footpath down to Millerground. When you follow this path down you come to a main road. Cross with care and opposite is the path to Queen Adelaide’s Hill. Twenty metres to the right is the path to Millerground. This path leads down the lakeshore. Walk about 15 mins (We were so tired from the walk we cheated and caught the bus up the road) and you will reach the lovely village of Bowness. This is a pretty place with wonderful restaurants, fudge and super ice cream shops. Then make your way to the pier to get your Lake Windermere Cruise back to Lakeside. (There are few different style of boats from this company, so don’t worry if it looks different). Perfect opportunity for a well deserved ice cream at this point- so many shops and flavours to choose from, near the pier. The journey back takes about 30 mins and is super relaxing and refreshing after your walk, plus you get to see the other side of the lake from what you saw on the way there. We loved looking at all the beautiful houses and boats on the way home. Back to the beautiful Lakeside hotel!